The Great Mars’ “Methane Debate” – Biology or Illusion? a potential sign of biology vs methane on Mars as an Earth' based illusion. The evidence for methane on Mars may actually be due to Earth-based methane, say researchers led by Kevin Zahnle of the NASA Ames Research Center in Moffett Field, California. "This is not a done deal," says Zahnle. While most researchers have assumed that this was due to an as-yet-unknown Martian process, Zahnle's team found that the dips in the spectrum are not due to Mars-based methane. In 2009 from a team led by Michael Mumma at NASA's Goddard Space Flight Center in Greenbelt, Maryland used ground-based telescopes to look at light emitted by Mars and attributed dips in the spectrum to martian methane absorbing those frequencies -a possible sign that life may have existed on the Red Planet sometime in the distant past. The readings, taken several years apart, suggested that methane's lifetime in the Martian atmosphere is unexpectedly – and inexplicably brief. Mumma's team focused on readings taken when Mars was either moving toward or away from Earth, when any dips in its light would be shifted to higher or lower frequencies and so could be separated from dips caused by methane in Earth's atmosphere. But Zahnle's team notes that the frequency of a spectral dip attributed to Martian methane could also be caused by earth-based methane containing carbon-13 instead of the more common carbon-12 isotope. Mumma, however, is confident his team measured Martian methane. "My group does not publish until we're certain we've exhausted all other possible explanations," he says. Clearer answers to the methane question may be on the way soon, with the launch of NASA's Mars Science Laboratory (MSL) rover in 2011 and a joint NASA-ESA orbiter called the Trace Gas Orbiter scheduled for launch in 2016. An earlier study by Sergio Fonti (Universita del Salento) and Giuseppe Marzo (NASA Ames) have used observations from NASA’s Mars Global Surveyor spacecraft to track the evolution of the gas over three martian years. 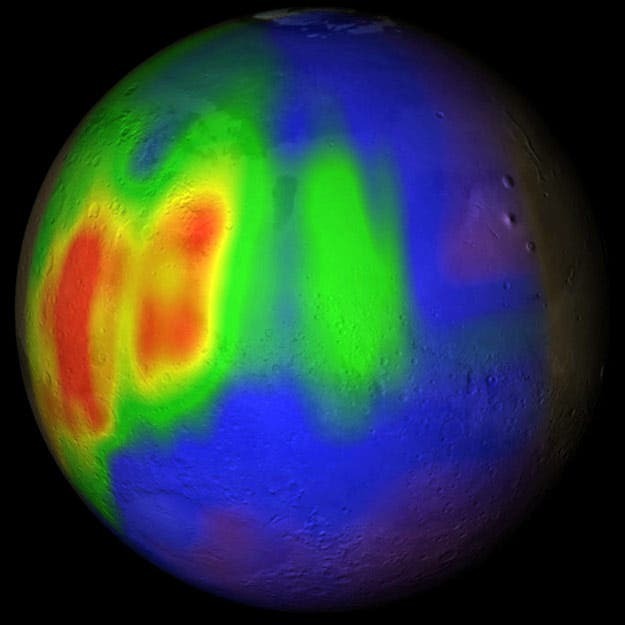 Their findings indicates that methane in the atmosphere of Mars lasts less than a year. Methane is replenished from localized sources that show seasonal and annual variations. This pattern of methane production raises questions as to whether the methane comes from geological activity – or biological processes. The atmosphere on Mars consists of 95% carbon dioxide, 3% nitrogen, 1.6% argon, and contains traces of oxygen and water, as well as methane. They found that levels of methane are highest in autumn in the northern hemisphere, with localized peaks of 70 parts per billion, although methane can be detected across most of the planet at this time of year. There is a sharp decrease in winter, with only a faint band between 40 and 50 degrees north. Concentrations start to build again in spring and rise more rapidly in summer, spreading across the planet. In June of 2010, Mumma and colleagues completed a 10-month-long campaign to hunt for Martian methane using three large telescopes in Chile and Hawaii. They hope to have new methane results in a few months to help NASA whittle down a set of four potential landing sites for MSL. The rover is set to launch in November 2011. We'll pace our bet on methane on Mars.